I2C is one of the most popular protocol used in industry for many purposes. Here we will see the technical details of this protocol with its advantages and disadvantages. 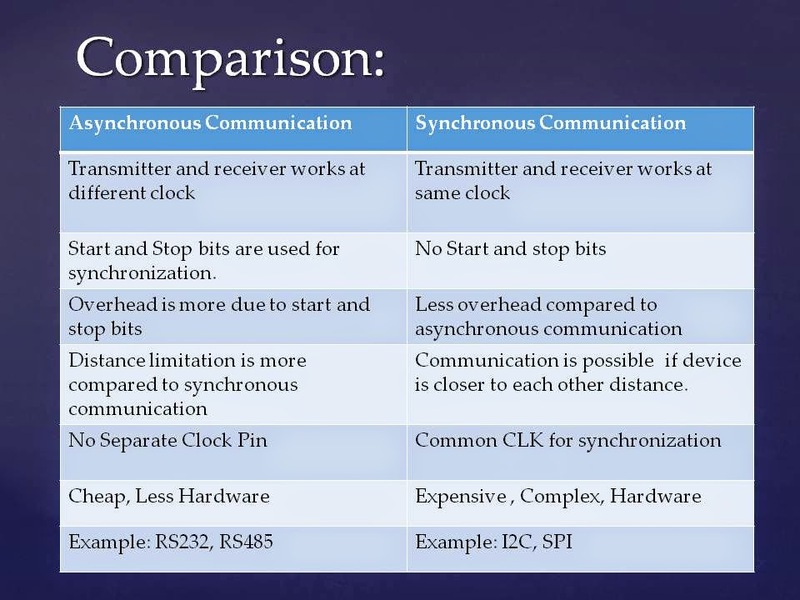 Communication between different peripheral IC likes EEPROM, Flash, RTC, ADC. Before Going to I2C technical specification. You need to know the meaning of synchronous and asynchronous communication. You need to set the same baud rate at Transmitter and receiver end. You can observe the corrupted or garbage data if there is the mismatch in baud rate at both ends. Baud rate depends on is depend on clock frequency. Start and stop bits will be sent at the beginning and end of file transmission to synchronization. Parity bit (Even, Odd parity) is also sent along with the data. Xon/Xoff bit is used when communicating with the slower device in case of serial RS232 communication. Due to extra bits for a start, stop & parity bit, overhead in communication is high. I2C is half duplex communication so you cannot send and receive data at same time. that why it has only one data line SDA. 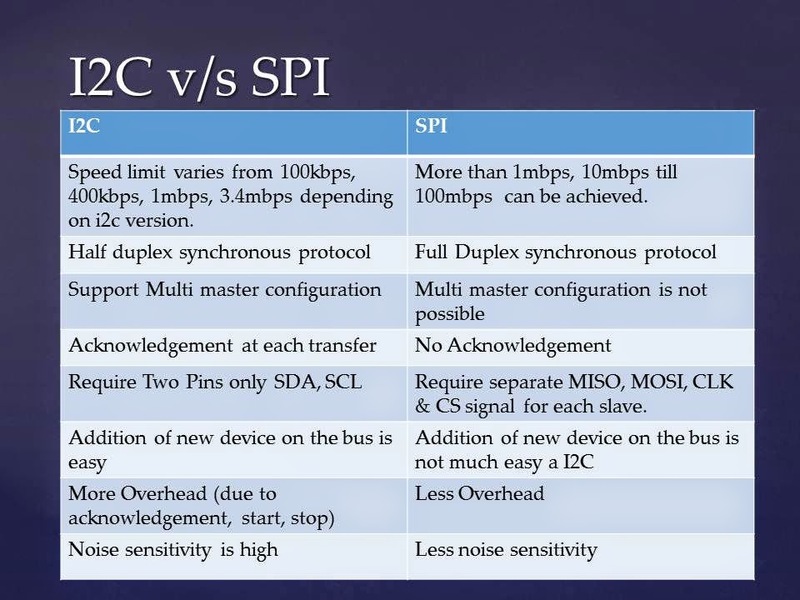 In case of SPI which supports full duplex, you can have two separate lines for Tx and Rx. A device which can initiate the transfer operation is the master device. Master device controls the bus and clock signal. Master generates the clock signals. A device which involve in communication with the master. A slave can not initiate the transfer of data. A slave can not generate the clock signal. Slave to slave communication is not possible as the slave can not initiate the transfer of data. 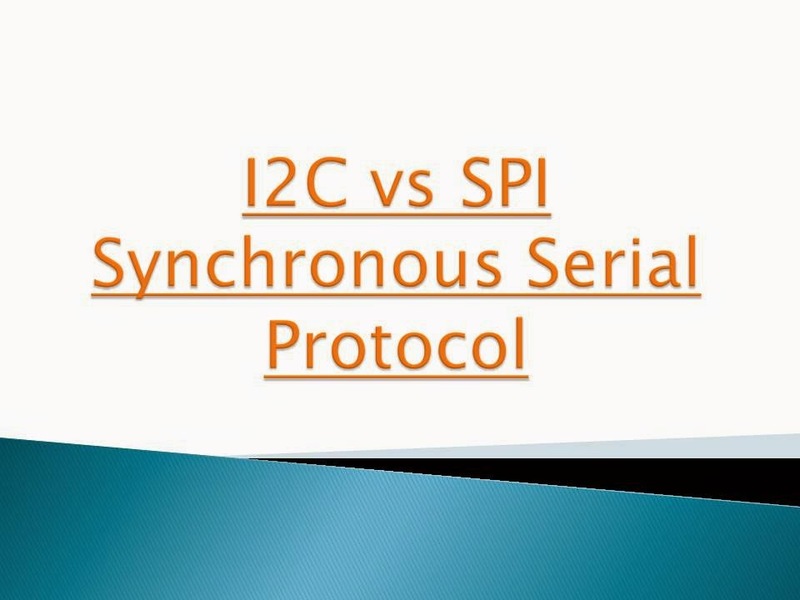 If you are working on application level then you might not come across the I2C protocol. 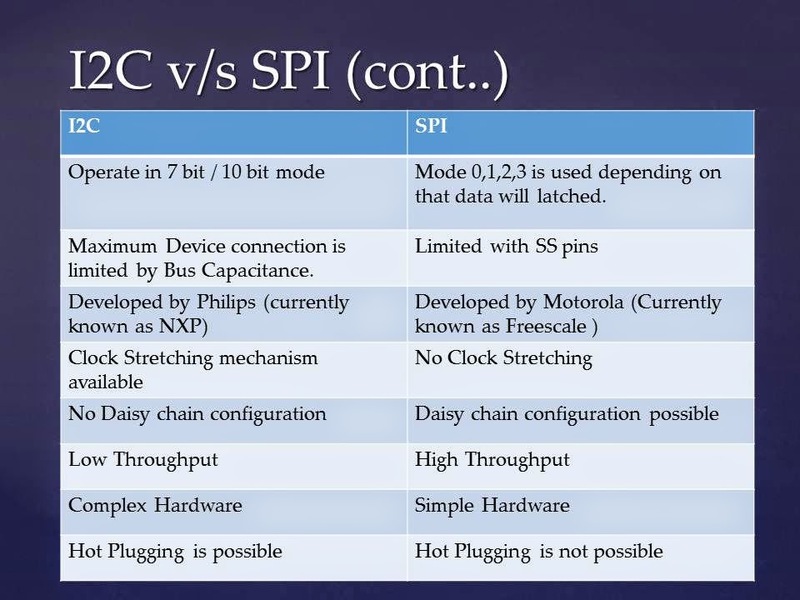 But If worked at lower layer then you should know about I2C. You have 7 / 10 bits for addressing. So theoretical you can connect 2^7 and 2^10 device on the bus. But practically it is not possible to connect that much devices on the bus due to bus capacitance. In I2c, you have two lines; one is SDA (Data) and SCL (Clock). To indicate the start of a frame, you need to send the start condition. And at the end you need to send the stop condition to indicate the end of the frame. Start condition: It is indicated by pulse sequence - when Clock remains the high level and Data goes from High to Low. Stop condition: It is indicated by pulse sequence - when Clock remains the high level and Data goes from Low to High. As I2C support acknowledgement mechanism. I2C follow the predefined sequence to send out the data frame. To send out the data, you need to follow the below sequence in more generic case. It may deviate to some extent depending on the IC to which you are communicating. To indicate the acknowledgement slave pull down the data line to low on success. As i2c support multimaster configuration, arbitration comes into the picture. Arbitration is the mechanism by which it is decided that who get the bus in case of more than one master tries to access the bus.